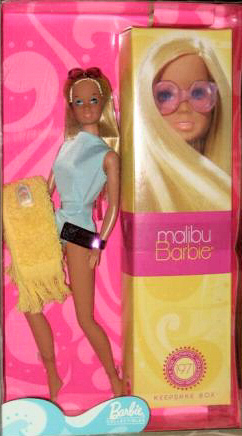 Mattel celebrated Malibu Barbie 's 30th Anniversary with a reproduction of the original doll, swimsuit, beach towel and sunglasses. This doll, from the Pop Culture Collection, was mass produced and is still in fairly good supply. The introduction of Malibu Barbie in 1971 was, to many collectors, the end of the Mod era and many vintage and Mod Barbie collectors do not collect Malibu Barbie Dolls. The doll, with her rich golden tan, today represents an era long gone, when sunbathing was a sport to many teenage girls and boys - long before the advent of sunscreen!